Hypotrichosis simplex is a rare form of hereditary hair loss without other abnormalities. Affected individuals typically show normal hair at birth, but experience hair loss and thinning of the hair shaft that starts during early childhood and progresses with age. Hypotrichosis simplex can be divided into 2 forms: the scalp-limited form and the generalized form, in which all body hair is affected. 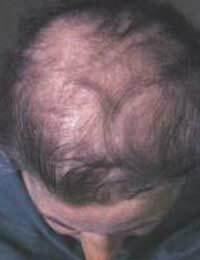 The progressive thinning of the hair shaft is a typical feature of androgenetic alopecia, a common form of hair loss in both men and women. Hypotrichosis simplex can be inherited either as an autosomal dominant or autosomal recessive trait. To date, there is no treatment for this condition. Currently, few genes have been known that casually correlate to the disease. However, a group of German and Swiss researchers, under the Institute of Human Genetics of the University Hospital of Bonn, have recently learned of an additional gene contributing to this hair loss disease. After studying three ancestrally different families, the individuals affected with hair loss symptoms were found to have mutations for a gene encoding for lanosterol synthase (LSS). This enzyme has a responsibility involved in cholesterol metabolism. A mutated LSS gene causes an alternative metabolic pathway for cholesterol, playing an important role in the hair follicle. LSS enzymes are found in the hair follicle cells, in which the hair roots develop in the follicle. A normal LSS gene has the enzymes situated in a system of very fine channels in the follicle cells, the endoplasmic reticulum. A mutated LSS gene situates the enzymes in the endoplasmic reticulum, but it also has the enzymes outside into the cytosol as well. This causes a malfunction leading to hair falling out. Of course, much more work is still left to be done and there are still a lot unknown to us about this disease and its why’s and how’s, in my opinion. But I think this study is an important step and there is now one less gene to be decoded to solve and complete this puzzle for the biological basis of this disease. Ultimately, the goal is to find ways to treat hypotrichosis simplex and prevent abnormal hair loss, whether it be just one way or other ways. And a way to reach that goal is by improving the diagnosis of this rare disease find the contributors. For additional information, click the link of the journal from the American Journal of Human Genetics. Prior to the research conducted in this article, this seems to be one of the less researched topics, in comparison to cancers and degenerate diseases. It is interesting that hair loss is now becoming an area of study to aid those whose suffer from it someday.